If you are like me and live in a cold climate (*cough* Central Canada *cough*), the winter weather can be really mean to your skin. From dry skin to dry cuticles and everything in between, hydration has been an important step in my nightly routine. I haven’t really been a lotion person until recently. For a while I had a few bottles of Bath and Body Works body lotions just sitting on my dresser, as well as a few trial size bottles of random brands that I got in various beauty boxes. Eventually I got to a point where I really just wanted to use the stuff up so I started to lather it on every night. It took a few months but I have finally finished my B&BW body lotions and have found a few products that I have been loving and use religiously at night to stay hydrated. 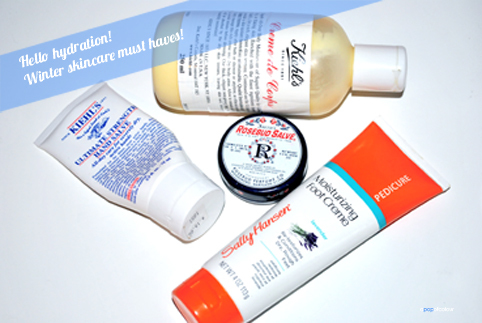 For my body, I have been loving Kiehl’s Creme de Corps, which is a cult favourite for a lot of people. They say that Las Vegas showgirls use this on their legs to make them look amazing, and although I don’t have legs anywhere near those of a Vegas showgirl, I can say that stuff is fabulous (so much so that I’m already on my second bottle). Creme de Corps does have a slight scent to it but nothing as strong as a B&BW lotion. If you are looking for something that will make you smell nice, this isn’t it (it does have a slight creamy smell; quite nice actually). Now what makes it so special? For me, it’s a few things. You know that greasy feeling you often get when you slather the stuff on your body and then you have to wait a while to get dressed? With Creme de Corps, the stuff settles into your skin after a few minutes; it doesn’t just sit on the surface. Secondly, you can actually feel it the next day. I apply this at night and the next morning my skin usually feels just so soft and smooth; it really does the trick. 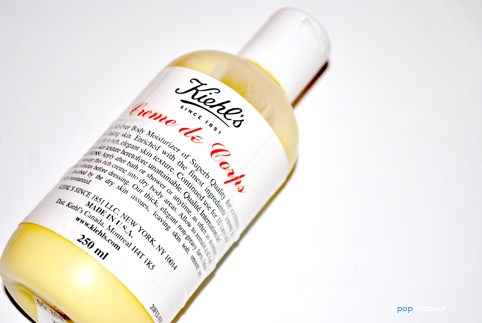 Kiehl’s Creme de Corps is quite expensive, however, they offer it in a variety of different sizes and price points. The one I have is the 250 ml bottle, which retails for a staggering C$37.50 a bottle, however, there are smaller sizes and larger ones (including a 1L bottle for C$87). If you are looking for a quality lotion that really does it’s job, then I would splurge and try it out. If you are looking for more of a scented lotion, then stick with the B&BW. Moving onto the feet, a few months back I noticed that my big toe was really dry so I dug out my Sally Hansen Moisturizing Foot Creme and have been it applying it every night before I go to bed. This product is part of their pedicure line, which includes a scrub and foot soap (as well as an abundance of different tools for your feet), however, I have found that it really does the trick for getting rid of dry skin. The product has a slight lavender scent, which is nice; and also absorbs quite quickly into your skin. Ever since I have been using this regularly I have noticed that my feet look less cracked and more moisturized. I also have the foot scrub and highly recommend using them together (pedicure post coming soon!). A problem area of mine quite recently has been my hands. Between the combination of washing my hands every few hours, painting my nails often, and the -40 degrees Celsius weather (with the wind chill), my hands have been taking a beating. 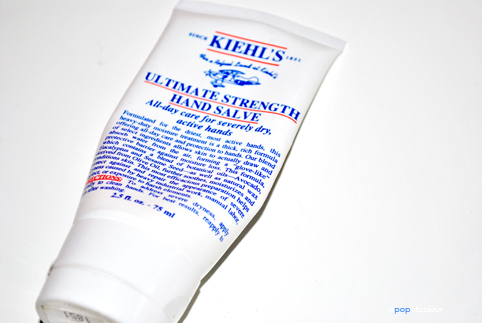 I often slather on Kiehl’s Ultimate Strength Hand Salve, which is a thick lotion that absorbs into your skin fast. It also have a peppermint smell to it, so it’s very relaxing. After the hand lotion, I will often reach for my Rosebud Salve and apply this to my cuticles. I have found my cuticles to be extremely dry and cracked, so I like to keep them hydrated throughout the night. Smith’s Rosebud Salve is one of my holy grail items that I cannot live without. Not only is it amazing for dry, chapped lips, but I also apply it on pimples, dry skin, and burns. 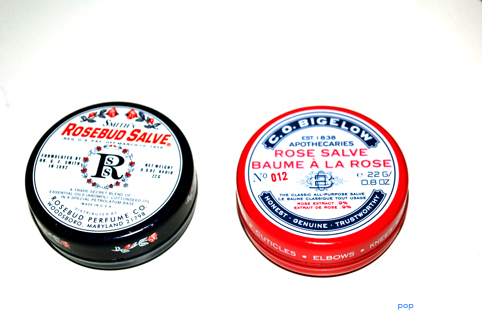 Right now I have two at home (one is Smith’s Rosebud Salve, the other is the C.O. Bigalow version), as well as one in my purse. If you haven’t tried it yet, go pick up a jar. Hopefully the extreme cold snap here in Central Canada is over for now, but there is still a few more months to go before summer. I hope my tips for dry, chapped skin are helpful and let me know some of your favourite products to use in the cold winter months to stay hydrated. « NOTD: OPI Suzi’s Hungary Again!